That the Rajatarangini did not call itself history but rather quite unequivocally traditional Sanskrit poetry, mahakavya or prabandha, and behaved like the latter, complete with its heavy use of rhetoric, myth, and aberration, a disruption and compromising of its otherwise fine display of objectivist qualities such as factuality, impartiality, and causality. Dividing the text against itself, thus the modern scholarly exegesis of the Rajatarangini, by and large, ended up transforming it as also suppressing, what this book will argue are its authentic representational tendencies and rich semantic possibilities. The making of early Kashmir is about rehabilitating the Rajatarangini to its own literary culture and thereby accessing the wealth of meanings pertaining to early Kashmir that it produced and preserved. Today a part of the Indian state of J&K, the valley of the river Vitasta (Jhelum) was, for at least 1500 years before Kalhana the kingdom or mandala of Kashmir. This book attempts to decode, this discourse that it seeks to interpret, to raise for the first time question of landscape and identity for early Kashmir. Before I explain how the book goes about this, it would be appropriate to say more about the relationship between regional history, culture, and representation to make explicit the premises underlying this exercise. A region does not express or possesses intrinsic meaning. Meaning is given or constructed through discursive practices, chief among which textualization performed by social actors such as Kalhana. A land coming into meaning is the birth of a region, in particular, a culture region. So regions are produced not just by material practices on the ground such as the drawing of boundaries or erection of gateways but, perhaps more powerfully by cultural practices of representation. A sustained representation inaugurates a discourse on the region, the power and efficacy of which derives from whether it is experienced as authentic by the community which it claims to represent and in which it circulates. The fact that Kalhana’s Rajatarangini gave rise to at least three sequels by other Kashmiris over the next four tumultuous centuries of Kashmiri history and was still regarded as the foremost representation of the land by Abul Fazl when the Mughals descended on the Valley in the late 16th century decidedly attests to the persistence of the power and deemed authenticity of Kalhana’s discourse. Perhaps the Rajatarangini’s fame and authority would have been confined to intellectuals; nonetheless, to what was owed this presage and enduring authenticity? I suggest that it is only when a discourse is embedded in a semantic-conceptual universe that is shared by the community that it can attain currency. For Kalhana and his representation of Kashmir, that shared cultural universe or framework by which people made sense of the world around them drew from the pan-Indic Sanskrit episteme. In particular, Sanskrit’s master texts and genres, such as itihasa, purana, kavya, and sastra, and their ethico-philosophical traditions relating to niti (principles), dharma (righteousness/duty), and karma (action), were the intertexts that furnished for early Kashmir the criteria for evaluating knowledge as relevant and true. However, in a little-noticed fact, Kalhana’s poem was also a foray into folklore and local oral traditions about the land, seen in the frequent references to Janasruti and Katha (people’s sayings and stories) as the source of verity, and in the invocation of popular memory as witness to Kashmiri history via the formula adyapi smaryate janaih (it is remembered by the people to this day). This fact also illuminates Kalhana’s choice of kavya for being a versatile and flexible mode that could entertain the mythic and the folk alongside classical and conventionalized registers of imagination and representation. The Rajatarangini’s authority perhaps stemmed from this apposite combination, among other things. That notwithstanding, reading Sanskrit culture out of a Sanskrit text may appear somewhat circular. However, as explained ones. Thus he lampoons and abuses figures of ritual or political authority for being pompous, debauched, or treacherous even as he celebrates and valorises some commoners for their talent and the socially insignificant, such as a prostitute or a cook, for their loyalty or bravery. Everywhere, Kalhana’s constant refrain or vantage, howsoever rhetorical, seems to be people’s welfare (prajanupalanam); his chief tirade is against persecution of the people (prajapidanam), and, in the highly judgmental piece of poetry that is Rajatarangini, Kalhana spares no one except the pure-minded (suddhadhi, sat, manasvi). Further, though the son of a former minister by the name of Canpaka who was possibly dismissed from the court of the Kashmiri King Hasrsa, it is noteworthy that Kalhana himself does not appear to have been at any king’s court (albeit he speaks at length and fairly penetratingly about the reigning monarch of his time, Jayasimha, the last in the line that he documents). This seems to set Kalhana apart from those of his peers who were court poets. It may account for the remarkably personal, sentimental, and individualistic takes on view in the Rajatarangini and the acerbic and hypercritical tone that cuts through Kalhana’s poetry. It also has implications for the kind of extra-royal locales and, therefore audience that his composition, which is so steeped in political culture, may have circulated amidst. Of course, the reading communities of the Rajatarangini cannot be known for certain, but a description in a contemporary kavya from Kashmir (Mankha’s Srikanthacarita) of a literary conclave or gosthi gathering at the house of a poet-laureate Alamkara in Srinagar for a poetic performance may well provide a clue. Further, rather than being read privately as a modern novel might, it is possible that Kalhana’s marathon composition was excerpted and its highly vivid content related orally to audiences at such events, true to a traditional rendition of a sravaya kavya (poetry to be heard). The making of early Kashmir is divided into three segments that deal with what I suggest are the text’s treatment of three different aspects of a region: time, space, and a form of space-time, if you will. While the first two concepts appear to be self-explanatory dimensions of apprehending the history of a region (though these are problematized by the Rajataranagini, as readers shall see), by space-time I refer to a framework capable of representing movement across spaces through time, in other words, a region’s external linkages in the longue duree. The first segment seeks to re-interpret the nature of the text, critiquing traditional scholarly opinion for persistently confining itself to the question of the Rajatarangini’s empiricist historical qualities, in the process rejecting the vast rhetorical and figurative component in the poem and inducing flawed oppositions between poetry and history. This chapter emphasizes the need to look instead at the meta-poetics of the genre of kavya to which the Rajatarangini belongs, and take seriously the special ontic an epistemic claim it makes on behalf of the kavi (the poet) and his extraordinary access to time – the past, present, and future. Surely this is the main reason behind Kalhana’s choice of Kavya for writing Kashmir’s tale of time. Combining this insight with the theory of ‘narrativity’, I observe that a certain organizing principle, rather than mere seriality, holds together in a unifying logic the multitude of disparate kings in the Rajatarangini. I identify that organizing principle, which brings an order of meaning to the sprawling account, as a model of orthopraxis or righteous conduct according to which Kalhana classifies and narrativizes- not just narrates- Kashmiri kings from the earliest till the poet’s own time. I further argue that the same ethical paradigm served as Kalhana’s mechanism for generating and structuring temporality. Much as historians privilege chronos as the chief interest of their discipline, bereft of topos time is rendered abstract and valueless. Indeed place is time made visible. Operating with the understanding that spatiality is as integral to historicality as time, the second segment is devoted to teasing out how the text transformed an abstract space into a specific place, namely Kashmir. Using the analytic of the landscape, I identify certain practices of places that the text employs to elaborate a region and a homeland. These included naturalistic and symbolic means. The chapter charts and analyses the Rajatarangini’s representation of the physical features of the land of Kashmir and the range of cultural constructions put on these through myth and memory. In other words, it views the land as landscape: geography overlaid with the narrative that generated a rootedness in the land. So the interpretation of myth in this book is not as history’s primaeval other, but as a special kind of historical strategy in so far as it inscribed and memorialized historical places and also stitched them to time. For a place with a sense of self so fashioned, reclaiming the past, or writing history, was a means to strengthening the self. 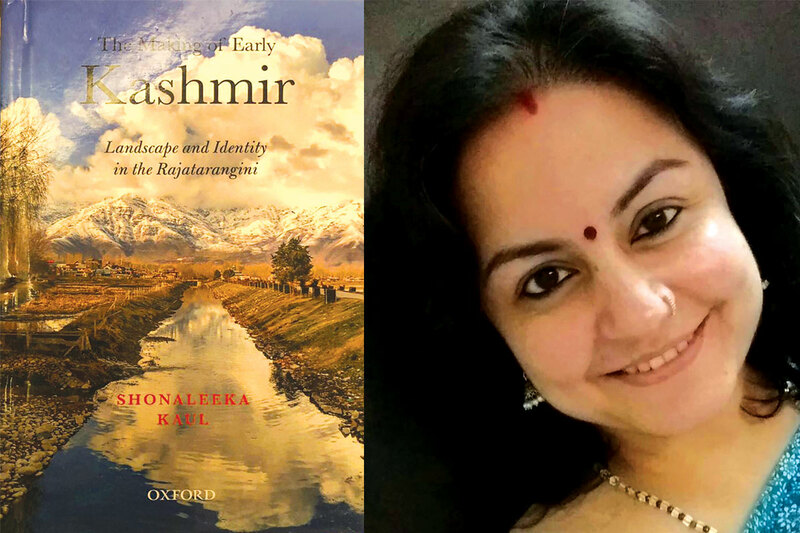 And given that landscape is manifested narration, the key of the Rajatarangini’s portrayal of Kashmir as a deeply sacred geography was also, I argue, to provide a synergistic backdrop against which Kalhana’s ethicized political commentary could unfold. Geography and polity were brought together to essay an instructive contrast. Finally, the Rajatarangini’s vivification of Kashmir as a landscape is shown in this chapter as a primary site for the intersection of the local and the universal in the literary constitution of Kashmir’s regional identity. The third segment adopts the lens of ‘connected histories’ to formulate the geo-cultural location of early Kashmir and situate her in relation to the cultural configurations bounding her. In particular, it focuses on the relationship between the region and the supra-region, India, which has its resonance again in the vernacular and cosmopolitan literary traditions coming together in early Kashmir. How does the Rajatarangini understand this location? Can it be seen as a literary response to liminality and a peripheral and acculturated identity for Kashmir vis-à-vis the Indic cultural zone? Or were other dynamics at work and what do non-textual imaginaries testify in this regard? Towards this end, chapter 4 first maps Kashmir’s cultural encounters with other regions near and far, which the Rajatarangini refers to in abundance, and measures, as it were the role these may have played in Kashmir’s emergence as a culture region from very early times. 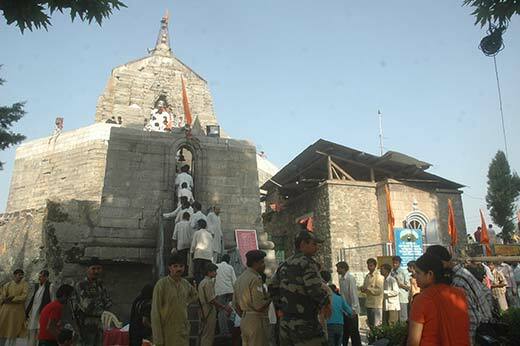 Shankar Acharya Temple , Srinagar. While empiricist studies (Harold Wilson, Aurel Stein, George Buhler) tended to make of Kashmir something of a curiosity and quaint exception in harbouring a historiographical impulse, later specialized works (Rafaelle Torella, Bettina Baumer) on the philosophical innovations in early Kashmir, though profound, by centring on Tantric Saivism or dhvani aesthetics, tended to create the impression of Kashmir as a melange of a few cultural exhibits, rather than a complexly constituted culture region. While some (B K Kaul Deambi) did go descriptively into aspects of Kashmiris external linkages, these were seen as offshoots of her ‘genius” and her ‘contributions’ to the world, rarely analysed or theorized in terms of implications for Kashmir’s own regional identity. Indeed, while historically thin notions of a peculiarly pluralist identity (‘Kashmiriyat’) have been devised for medieval Kashmir down to independence, and claims of a regional identity based on a single religion for contemporary Kashmir are proffered, there is little understanding in mainstream scholarship of the emergence of early Kashmir as a culture region (as different from a geographical region) and the many material, linguistic, literary, ethnic, ritual, artistic – and not only religious -processes that constituted it as such. One likes to believe that recent work in the West (Yigal Bronner, Lawrence McCrea. Walter Slaje) is attempting to rediscover ancient Kashmir through the medium of Sanskrit theory but there, too, coming from philology, a fuller integration of the literary with the historical-anthropological perspective also a consideration of the interface of Sanskritic with vernacular culture, is at best a project in progress. This book locates itself within this nascent recasting of the gaze on early Kashmir but does so using fresh hermeneutical and comparative -historical methods and perspectives. It asks new, interdisciplinary questions of a comprehensive range of discursive and material representations of early Kashmir in the hope of defining the region both spatially and ideationally. The making of early Kashmir does not claim or seek to be a comprehensive analysis of all early Kashmiri culture. Its chief ambitions are: first putting out a critical reinterpretation of a literary classic of iconic stature, in the process defining anew the problem of history and historicality in pre-modern South Asia. And second, bringing clarity to our understanding of the genesis and cultural composition of a region long subject to scholarly and political assumptions and clichés.